Plum or apricot dumplings are one of my favorite Slovak dishes. Since these fruits are now in season, I figured you may want to try them. They are very easy to make and quite different from anything in the typical American cuisine. Here is how to make fruit dumplings (ovocné knedličky). Here are the plums and apricots I used. I left the pits in but you can take them out if you like. 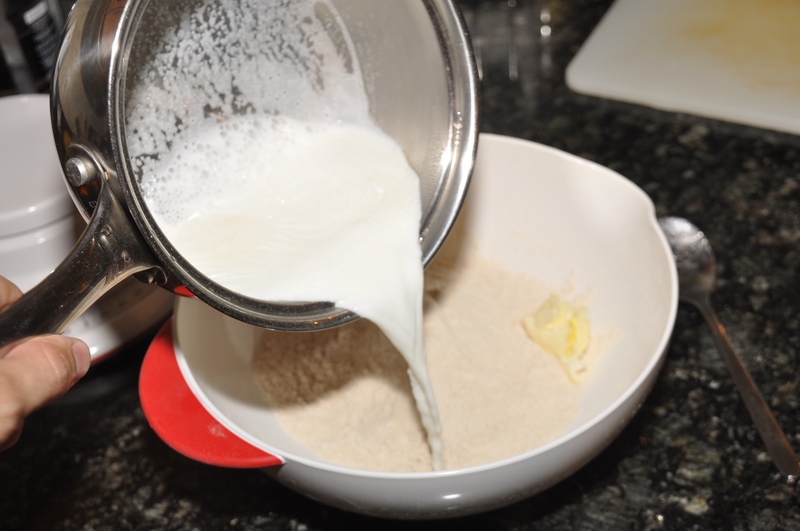 Bring the milk to a boil and add to the flour along with one tablespoon of butter. 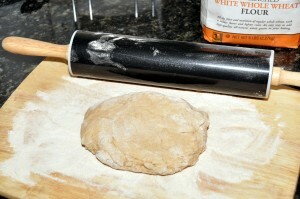 Add salt and mix until you get semi-hard dough. 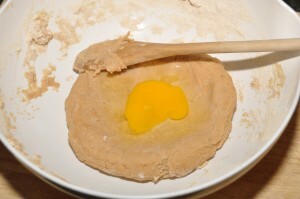 Wait for the dough to cool off before adding the egg. Keep mixing until you get a smooth dough (cesto). In the mean time, bring a large pot of salted water to a boil. Transfer the dough onto a board dusted with flour and, using a rolling pin, roll to thickness of about 5 mm. 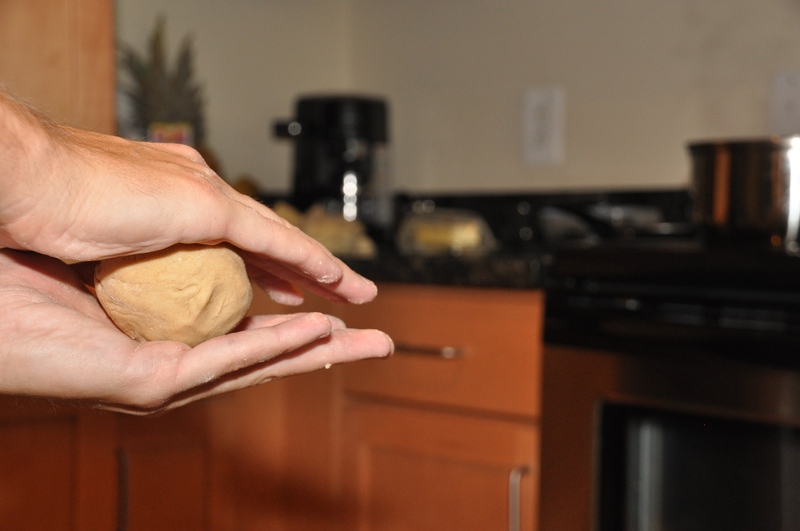 Cut the dough into pieces about the size of your palm. Wrap a plum (slivka) or an apricot (marhuľa) in each square. 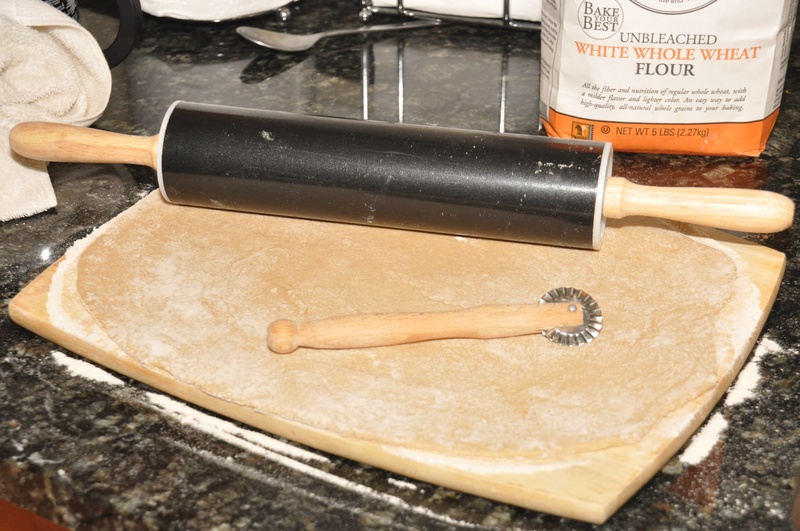 First spread the dough over the fruit, and then roll it between your palms (it helps to dust them with flour first) to smooth out any non-uniformities. Cook the dumplings until they float up. This will take about 10-15 minutes. 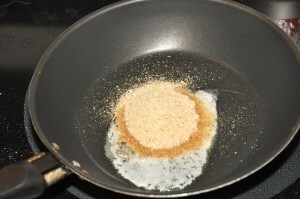 In the mean time, melt the remaining butter and add the breadcrumbs (strúhanka). Fry for few minutes until they turn brown. Turn the heat off, and add the powdered sugar. Drain the dumplings and top with the delicious toasted bread crumb topping along with more melted butter. My dumplings look brown because I used a whole-wheat flour, they will be white if you use the all-purpose kind. Enjoy! By the way, there are other recipes for these dumplings. 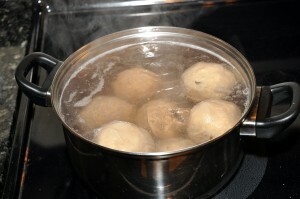 One of the first recipes on this website was for plum dumplings made with a dough that you stir in a pot on the stove. Those were topped with poppy seeds. Another common topping is cinnamon. And if you are into sweets, make sure to checkout žemlovka, an apple bread pudding, as well as poppy seed noodles. All these dishes are eaten as the main course for lunch or dinner. Who said that lunch or dinner must be salty? By the way, I apologize for the rather infrequent posting frequency over the past few months. Although I have now completed my PhD., I am still really busy completing a follow on project. This project is ending in the next month so hopefully after that I’ll have more free time to post recipes – and hopefully start working on a cookbook. Having just returned from CZ and Slovakia, I am craving these. It was funny how hard to find they were on restaurant menus. They only made the ones with “kynute testo”, therefore all dough and not much filling. Will try your version for sure! As an aside, do you know of a good substitute for bryndza here in the US? Can bryndza be ordered I wonder? It’s hard to live without! http://www.slovczechvar.com. They have a large selection of anything you can think of and they do ship. what is a “dl” asked for in the milk for fruit dumplings? it says “1 dl” I don’t know what is refers to liters or grams or what? Edit: I updated the amounts in the recipe to include my best guess at the amounts in US units using online conversion calculators. Let me know if these amounts don’t work for you. You can always add more flour / milk if the consistency doesn’t seem right. But be careful, the egg will make the dough quite watery at first, only after you stir it for a while will it turn into something roughly resembling play dough. That is the consistency you want. l dl then means 1 cup? No, 1dL is about half a cup, 0.4 cups according to Google. I am hoping to find my notes, but they are probably long gone. The problem is, the original recipe called for 400g of flour, 2 dl milk, and one egg. I remember reducing the flour and milk amounts since 400g seemed way too much for the amount of fruit I had. This was correct as even with my reduction I ended up with leftover dough. Despite also having about 500g of fruit as given in the recipe, I think the difference was that my apricots were quite large. These dumplings are usually made with the tiniest apricots you can find, the ones that normally don’t get sold in supermarkets. 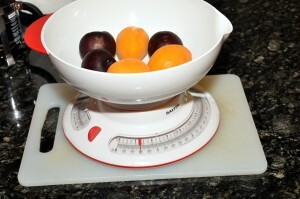 Smaller fruit -> more surface area (and hence more dough needed) per the same weight. The 300g and 1dL milk is my best memory of what I used, but take this with a grain of salt. for the US folks who are not used to a metric system, get a measuring cup that has both English and Metric volumes. You can get it in any store, glass measuring cup 32 ounces 4 cups, on one side measuring in ounces and cups on the other side you have measuring in liter, deciliters and milliliters. It’s not so difficult, and you can get it for some $1.50? oops, a small correction it’s a two cups, 16 ounces measuring cup (not 4 cups)and marked for 1/2 liter and so on in decimal scale. Thanks for the recipe, it’s delicious! I love finding tasty recipes that don’t require pitting. My plum tree bears fruit the size of a cherry, and it’s way too much work to pit them all. My husband tried your recipe today. It was out of this world! 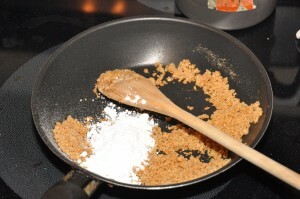 We did make a tiny change and with some of the bread crumb mix (not all) we added cinnamin. With and without the cinnamin, it was delicious! I wanted a good dessert recipe. Something that involved fruits and not ice cream or chocolate this time. I found this and tried it and it is absolutely adorable. Tried it with all-purpose flour then with whole wheat. I like the latter better. Great recipe. We just made apricot dumplings a few nights ago. When mom says she is making them all the cousins and kids come over to help and enjoy. We always use breadcrumbs and butter with powdered sugar.Our family is from Piestany. Could you also steam the dumplings for the same effect? I think that my Slovak Grandma used to steam hers. Can these be prepared ahead of time and frozen, prior to adding the breadcrumb coating? Mary, I don’t really know but I may see some problems with it. You would have to defrost it before applying breadcrumb, etc. I may see a problem with freezing kendlicky containing fruits, as in defrosting process frozen fruits release a lot of moisture and it can get messy, it’s different from lets say some frozen meat filling. But as I said, it’s just my opinion and I never did it. I think so, because i just bought a pack of frozen sweet dumplings. Also, my mother-in-law keep her homemade sweet knedliky in the freezer and when we visit her, she just cook it directly. She cooked them with a cloth on a large pot… steamed them. while trying to think of how my grandmother made fruit dumplings my husband told me to look it up on the comp. I remember her putting farina in the dough along with the flour. instead of bread crumbs she used melted butter, cottage cheese and granulated sugar. as I write this, things are coming back and remember her just picking a handful of dough and covering the fruit. she was a wonderful Czech cook. houska, kolacky etc. is there a czech fruit cake? Thank you for the recipe. I used to have a Slovak cookbook that got misplaced in moving and cannot find. 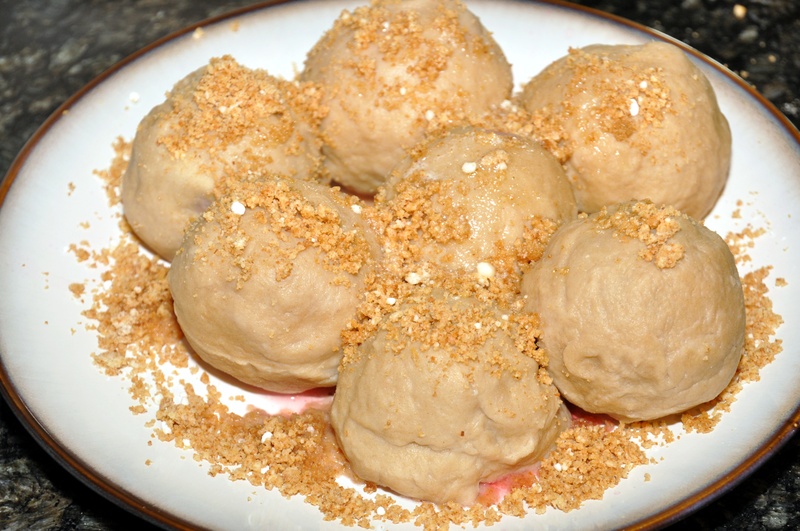 We used to call these “gumbalza” and Grandmom used to use her canned plums in the center of the dumpling and reduce the syrup from the canned plums and serve it warm to pour over the fruit dumpling. We just had a family reunion and my cousin was looking for this recipe. I can now give it to him!!! But I just think I remembered my Grandmother using mashed potatoes in her dumpling dough, but I may be wrong. My grandmother used any fruit that was in season … apples, peaches, plums, strawberries, and in the winter prunes. She put some sugar and cinnamon inside the dough with the fruit and then after boiling topped them with farina browned in a cast iron skillet with butter and sugar and then put them in the oven for a little bit. Such yummy fun to remember how good they were. My mom and dad made them too and I think it’s time for me to try out the posted recipe! Of course grandma had her own fruit that she picked when ripe so the fruit was organic and tasty! She arrived at Ellis Island Christmas Eve 1912 with a 10-month old and managed to have every fruit tree and a big garden and 8 more children! Amazing generation! Thanks for the recipe! My Italian mom got the recipe from my Czech grandma and made these every year with plums, near all our birthdays in September. 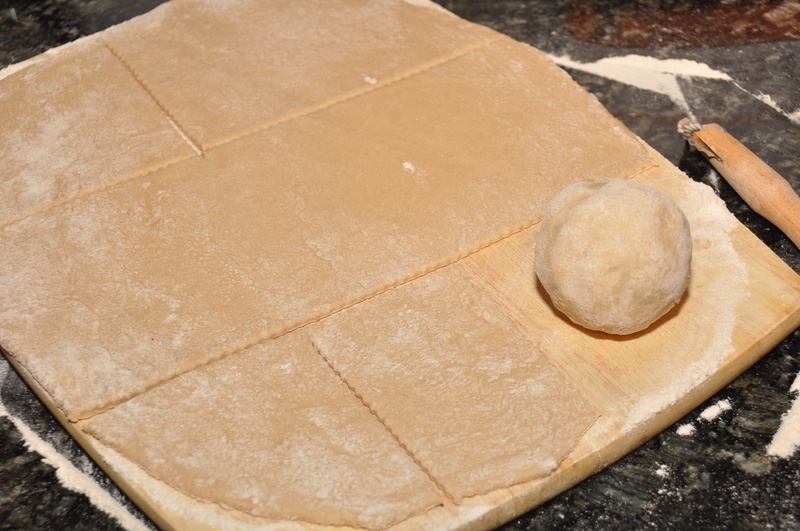 We did use potatoes in the dough, though. It was (and still is) our once a year desert for dinner, now made by my Danish wife. Bruce, what a great story. An example of food globalization. The region of north central slovakia I come from– is full of ‘masny surname’. Great to see it. Cheers mate! My grandmother’s recipe has cottage cheese in the dough along with eggs, melted butter, baking powder, salt, sugar and, of course, flour. 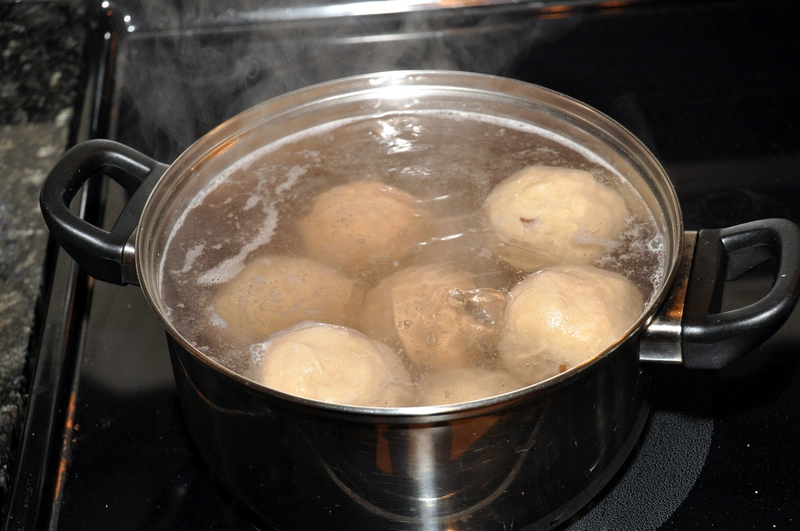 We boil the dumplings in salted water until done. Served with melted butter and sugar. It’s always a fall treat! She was from a small farm village about 70 miles south of Prague.